NETWORK FINALS: The rerun of HAWAII 5-0 gained 0.1 and the reruns of MACGYVER and RIVERDALE lost the same in final numbers. 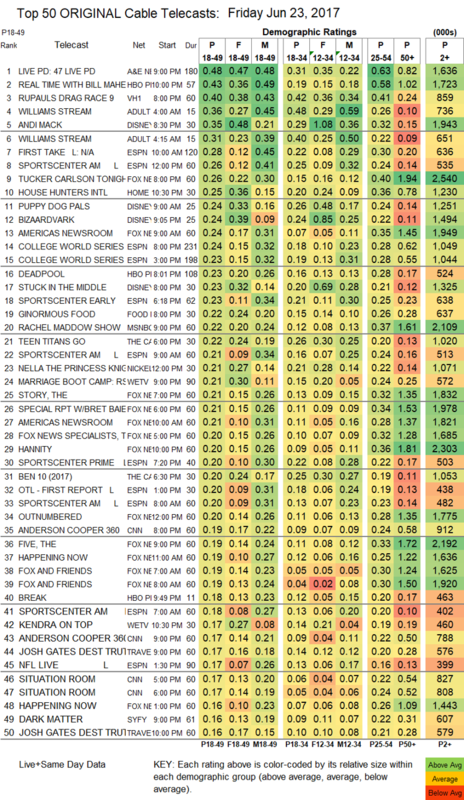 CABLE HIGHLIGHTS: A&E’s LIVE PD stayed at the top of Friday cable, despite a 0.08 drop to 0.48. HBO’s REAL TIME WITH BILL MAHER gained 0.02 to 0.43. The season finale of VH1’s RUPAUL’S DRAG RACE jumped a tenth to 0.40. On Adult Swim, the very-late-night WILLIAMS STREAM segments were at 0.36/0.31, compared to last week’s 0.35/0.31. Disney Channel’s ANDI MACK had a 0.11 bump to 0.35, with lead-out BIZAARDVARK at 0.24, lead-in STUCK IN THE MIDDLE at 0.23, and early morning PUPPY DOG PALS at 0.24. The cable news title went to Fox News with TUCKER CARLSON TONIGHT at 0.26/2.5M, ahead of MSNBC’s RACHEL MADDOW SHOW at 0.22/2.1M and CNN’s ANDERSON COOPER 360 at 0.19/900K. On HGTV, HOUSE HUNTERS INTL dropped 0.06 to 0.25. ESPN aired a pair of COLLEGE WORLD SERIES game at 0.24/0.23. Food Network’s GINORMOUS FOOD ticked down to 0.22. We’s MARRIAGE BOOT CAMP slipped 0.02 to 0.21, and KENDRA ON TOP returned at 0.17. 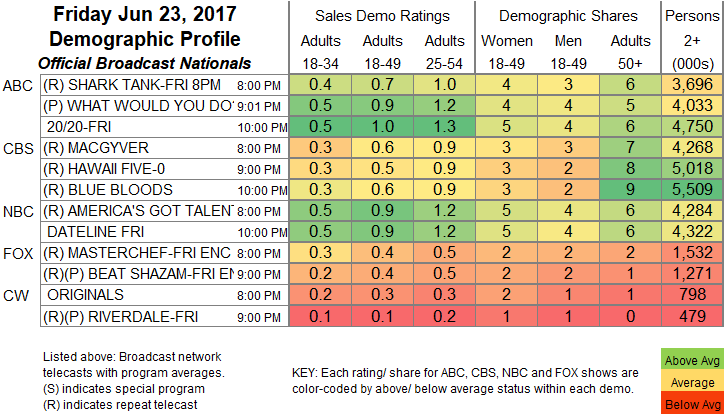 On Syfy, DARK MATTER lost a tick to 0.16, and WYNONNA EARP was down 0.02 to 0.12. USA’s PLAYING HOUSE returned with a pair of episodes at 0.15/0.10.